Press the needle bearings (shock link side and swin­garm side) out of the shock link using the special tools and a hydraulic press. Attachment, 24 x 26 mm Pilot, 20 mm Attachment, 30 mm I. D.
Press the needle bearings (shock absorber side) out of the shock link using special tools and a hydraulic press. Attachment, 24 x 26 mm Pilot, 19 mm Attachment, 30 mm I. D.
Press the needle bearing into the shock arm with the marked side facing out. Press the needle beanng into the shock arm with the marked side facing out. Pack a new needle bearing with grease. Press a new needle bearing into the shock absorber side pivot with the special tools and a hydraulic press so that the needle bearing surface is 3.0 — 3.2 mm (0.12 — 0.13 in) below the end of the shock arm surface. Pack new needle bearings with grease. Press new needle bearings into the swingarm side pivot with the special tools and a hydraulic press so that the needle bearing surface is 4.4 — 4.7 mm (0.17 -0.19 in) below the end of the shock arm surface. Press new needle bearings into the shock link side pivot with the special tools and a hydraulic press so that the needle bearing surface is 6.0 — 6.5 mm (0.24 — 0.26 in) below the end of the shock arm surface. 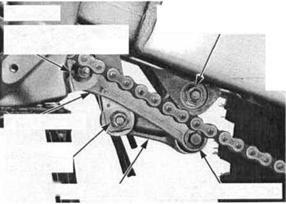 Remove the needle bearing from the shock link. Press the needle bearing into the shock link with the marked side facing out. Press new needle bearings into the pivot with the special tools and a hydraulic press so that the nee­dle bearing surface is 4.4 — 4.7 mm (0.17 — 0.19 in) below the end of the shock arm surface. Apply multi-purpose grease NLGI No.2 (molybde­num disulfide additive) to the shock arm, dust seal lips, side collar seating surface and needle bearing rolling area. 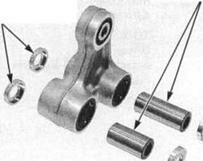 • Make sure the needle bearing rollers are in posi­tion before installing. Install the dust seals and washers (shock link side). Install the dust seals to the shock arm (swingarm side). Install the pivot collar, side collars and dust seals (shock absorber side). Install the pivot collars and side collars to the shock arm (swingarm side, shock link side). Apply multi-purpose grease NLGI No.2 (molybde­num disulfide additive) to the dust seal lips, side collar seating surface and needle bearing rolling area. Install the dust seals, pivot collar and side collars. 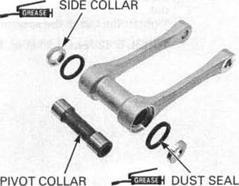 Apply oil to the shock arm and shock link nut threads and flange surface. 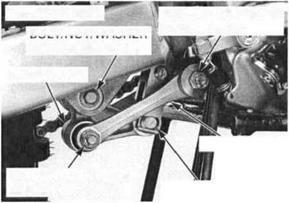 After ’07: Align the flat surfaces of the shock arm bolt and swingarm. Install the shock absorber lower mounting bolt aligning the flat side of the bolt with the stopper on the shock absorber. 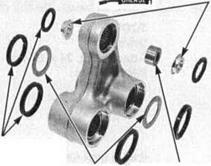 Tighten all nuts to the specified torque. 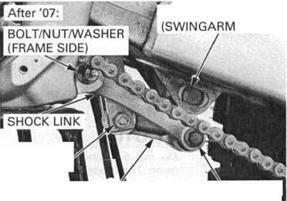 Install the drive chain roller with the mark facing out. 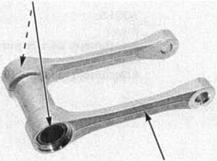 Tighten the nut to the specified torque. Install the step bracket assembly and mounting bolts. 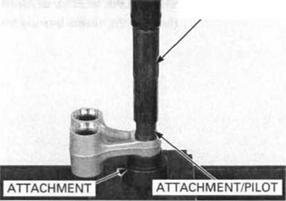 Tighten the upper mounting bolt to the specified torque. 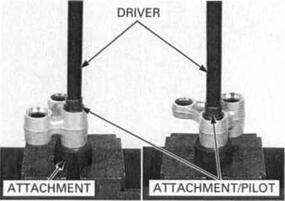 Tighten the lower mounting bolt to the specified torque. Install the left step, spring, joint pin, washer and new cotter pin securely as shown.